On the way to my parents house tonight, I stopped by Ojibway Park for a quick walk. I had been seeing Broad winged Skippers lately and wanted better looks. 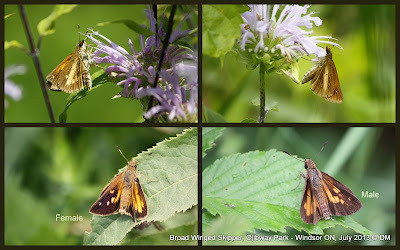 Upon walking up to a small meadow in the Spring Garden area of Ojibway, I saw a Hummingbird Clearwing Moth to my right, then to my left, I noticed another Clearwing Moth, ... with more of a yellow-black colouration... Snowberry Clearwing Hummingbird Moth?!?!?!? Are you kidding me? I literally have two frames of this moth and it was gone. Its funny, if you approach them very slowly, they seem to not mind your presence, but if you make a quick movement, such as move a camera strap, they can be a little shy. I saw another Clearwing Moth moments later as I was leaving. Its funny, once you "see" a new species, your seem to then see it more easily from that point on. It seems like butterfly life has really died down a little ... are we between broods? 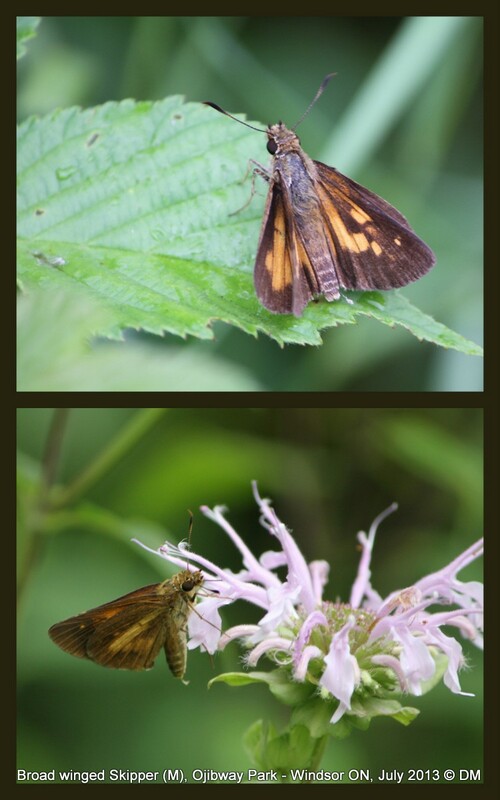 I did get some really nice looks at Broad winged Skippers though... I have male and female and dorsal ventral combinations... See below! 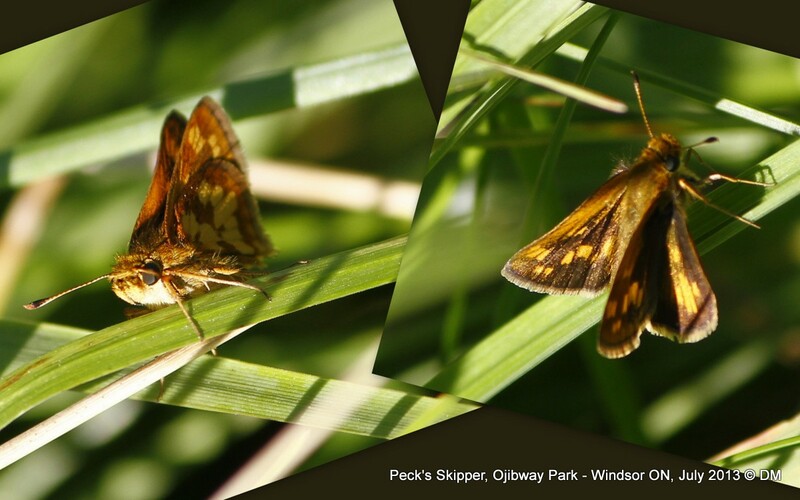 Branded Skipper Butterflies are a little difficult to identify because there are some strange wing positionings. 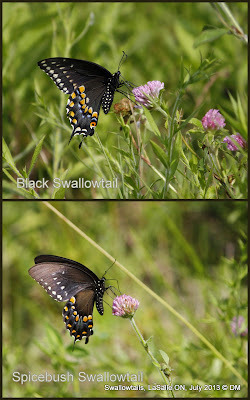 The two photos above show a male and female dimorphism, but it is more clearly seen in the dorsal perspective. The dorsal perspective though, for skippers can be strange because skippers hold their forewings up at a 45degree angle, so depending on the angle you are looking at the butterfly, you may see the upper forwing on the right, and the upper hindwing on the left. I don't know if I'm explaining that very well, but I think any butterfly watcher has to come to terms with that sooner or later! That playground had a few housing lots slated for development with lots of weeds. These two beauties flew by me in the mater of a few minutes. 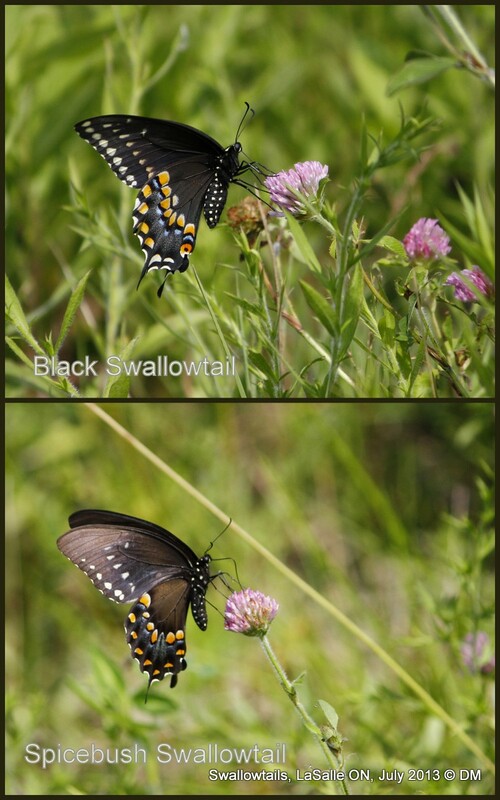 The top being a Black Swallowtail (see that small dot at the very bottom of its wings?) and a Spicebush Swallowtail, which has no "dot", and the band of orange dots is pierced by the blue colouring. Very cool eh?